choose the size you want in the drop down menu box. pouch. Carol to the rescue! Print letters and liked the look. She also asked for a wrist strap for the pouch. pocket accordion folded corners so that it will lie flat when empty. can also be used as a pocket. The pocket has a flap with Velcro(R). shows the sizes of fabric to cut for each, and the finished sizes of the pouches. in your PDF viewer before printing. 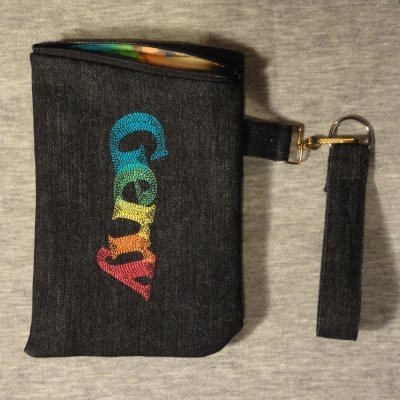 instructions for the pouch are the same as for the Zip-Around Eyeglass Case, found here. pouch. The Zip-Around Eyeglass Case instructions do not provide for the wider sizes. what a great project,what contour size has been used in this project?? Thank you, Susana. 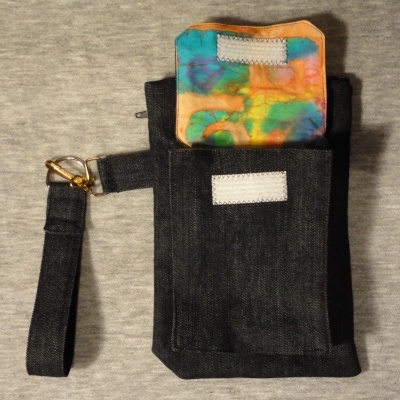 I used the 60 mm size for this pouch. The actual letters are smaller, but 60 mm is the size at which I digitized the rectangles surrounding the letters. See the Guide to Contour Print for more information about sizing. If you jumble the letters as I did here, you can remove the rectangles first. I have a second set of the alphabet, for which I added "unboxed" to the folder name. I now can use those letters without having to remove the rectangles first. I have the originals, too, for when I want to arrange text neatly on a line. Ruching and Embroidery Equals WOW! Fabric Popped out of a Hoop? Re-Align It!